TOKYO (AP) At times, it seemed as if he'd go on hitting forever. To chants of "Ichiro, Ichiro, Ichiro" he was greeted at the dugout - and later in the dugout - by emotional embraces from teammates. 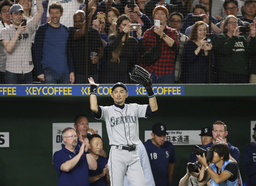 Yet when Mariners teammate Dee Gordon bowed, Ichiro broke into a laugh - like, "not necessary, bro." Ichiro was 0 for 5 in the two regular-season games against the A's in Tokyo, leaving him with 3,089 hits in 19 seasons - a sure Hall of Fame resume. He had 1,278 before that over nine years in Japan, making him baseball's all-time hits leader. "I'll be known as the `Man Formerly Known as Ichiro,"" he cracked. Ichiro admitted he badly wanted to get a hit in Tokyo. And his fans always wanted to see him play in the World Series - his teams made it to the playoffs just twice, never advancing to the Fall Classic. "I had 3,089 hits in America," he said. "But I think my wife - who always makes me rice balls before games - said she made 2,800 rice balls. So I wish I could have played long enough so she could have hit 3,000 as well."